The fact that the hanger is balanced embodies the hidden assumption that the equation is true. 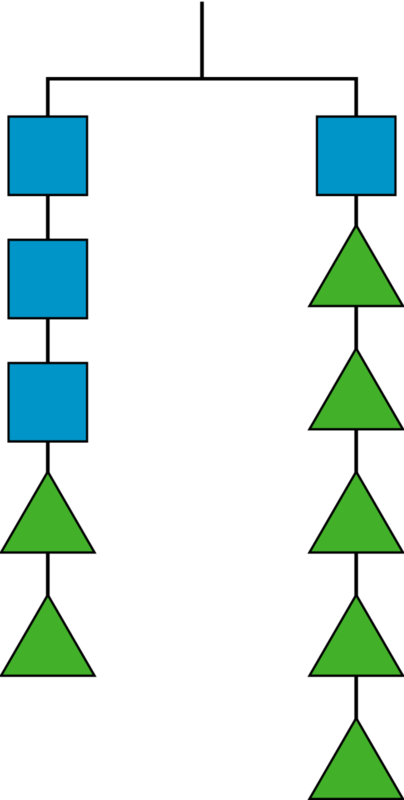 It is helpful for explaining why you have to perform the same operation on each side when solving equations; if you take two triangles from the left side you have to take two triangles from the right side as well in order to preserve the balance. This leads to a discussion of how performing the same operation on each side of an equation preserves the truth of the equal sign. But what happens with an equation like $3x + 2 = 3x + 5$? In this case, the hanger diagram is a physical impossibility: the right hand side will always be heavier than the left hand side. I can imagine that students who have an idea of an equation as “the left hand side is equal to the right hand side” might be confused by this situation, and think this is not a proper equation. Especially when they reduce it to $2 = 5$. Students learn to say that this means there are no solutions, but it’s hard to make sense of that response rule without understanding what’s really going on with equations. The fact is, an equation with a variable in it is neither true nor false, because it is merely a phrase in a longer sentence, such as “If $3x + 2 = x + 5$ then $x = \frac32$.” This sentence is true, but the phrases within it are not sentences and have no inherent truth or falsity. When we perform the same operation on each side of an equation, we are not only preserving the truth of the equal sign but also preserving the consequences of the equal sign. If we use if-then language when talking about equations, then we can make sense of equations with no solutions. A sentence like “If $x$ is a number satisfying $3x + 2 = 3x + 5$ then $2 = 5$” makes perfect sense. It’s the mathematical equivalent of “If the moon is green cheese, then I’m a monkey’s uncle.” It’s a way of saying the moon is not green cheese . . . or that there is no solution to the equation. The middle schooler’s version of if-then language might not always use the words “if” and “then.” You might say “Imagine there is a number $x$ such that $3x + 2 = x + 5$. What can you say about $x$?” Just as you say “Imagine this hanger is balanced and the green triangles weigh one gram. How much do the blue squares weigh?” I think it’s a useful approach with students to remember that equations are a matter not just of truth, but of truth and consequences. Your explanation that an equation is understood as a true conditional statement with a consequence of the solution makes some sense, but has some problems with confusions as well that you point out with the example of an equation with no solutions. It might be helpful to discuss the nature of existential and universal quantification and open statements ( predicates) with variables rather then treat equations or identities initially as propositional statements. What do we mean when equation has a solution but we cannot know what that solution is exactly in a particular form, or it equation is true for any number, like 2(x+1)=2x+2 ? Perhaps the conditional statement for an equation Is of the form if x=2 then 3x+1=2x+3 which is true, while if x=1 then 3x+1=2x+3 is false. The equation that has no solution fits in this scheme as there is no true conditional statement with the equation as its consequence. Certainly a good beginning on the issues worthy of further thought and discussion. x^2 = -1 which has no solutions that are real numbers, but x = i and x=-i when imaginary numbers are allowed (but what does this mean when we distinguish the symbols from the numbers they represent?). YES, There are many truths and consequences that are worthy of further discussion at many grade levels. Hopefully we can make sense of all these by enlarging and deepening the discourse as the level increases without having to make revisions that confuse a student who remembers the earlier responses.